The United States Air Force's X-37B space plane has now been in orbit for nearly three months on its fourth mystery mission. The X-37B spacecraft launched aboard a United Launch Alliance Atlas V rocket from Florida's Cape Canaveral Air Force Station on May 20, kicking off a mission dubbed OTV-4 (short for Orbital Test Vehicle-4). During its nearly 100-day trek in orbit, the X-37B has been spotted by amateur astronomers on Earth as it carries out is secret mission. The reusable X-37B space plane looks like a miniature version of NASA’s now-retired space shuttle orbiter. The military space plane is 29 feet (8.8 meters) long and 9.5 feet (2.9 m) tall, and has a wingspan of nearly 15 feet (4.6 m). The spacecraft sports a payload bay about the size of a pickup truck bed. 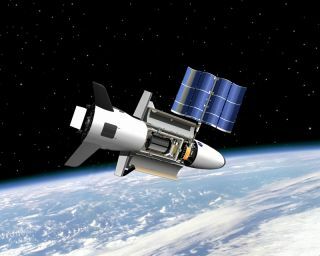 The X-37B's payloads and specific activities are classified as a general rule. But, for the first time in the program's history, the Air Force revealed a partial manifest of the gear carried by the craft shortly before OTV-4's launch. The Air Force Rapid Capabilities Office (AFRCO), which runs the X-37B program, said it collaborated with several partners to test new experiments on the current mission. For example, a NASA advanced materials investigation launched on OTV-4, as did an experimental propulsion system developed by the Air Force. "With the demonstrated success of the first three missions, we’re able to shift our focus from initial checkouts of the vehicle to testing of experimental payloads," AFRCO director Randy Walden said prior to OTV-4's launch. Furthermore, on July 1, California-based company Aerojet Rocketdyne announced that its XR-5A Hall Thruster had completed initial on-orbit validation testing onboard the X-37B space plane. The XR-5A Hall Thruster is an enhanced version of Aerojet Rocketdyne's XR-5 Hall Thruster. The 5-kilowatt XR-5A incorporates modifications that improve performance and operating range, according to company representatives. The X-37B program completed its third mission (OTV-3) on Oct. 17, 2014, with a landing at Vandenberg Air Force Base in California after 674 days on orbit. OTV-3 extended the collective time spent in orbit by X-37B vehicles to 1,367 days. Onboard the X-37B is Aerojet Rocketdyne’s upgraded XR-5A Hall Thruster, which demonstrated successful on-orbit operations. How many days the current OTV-4 mission will chalk up in space is unknown. And, though OTV-1, OTV-2 and OTV-3 all touched down at Vandenberg, it's unclear where OTV-4 will return to Earth. In 2014, it was announced that Boeing Space & Intelligence Systems had consolidated its space plane operations by making use of NASA's Kennedy Space Center (KSC) in Florida as a landing site for the X-37B. Under the Boeing plan, a former KSC space-shuttle facility known as Orbiter Processing Facility (OPF-1) is being converted into a structure that will enable the Air Force "to efficiently land, recover, refurbish and relaunch the X-37B Orbital Test Vehicle (OTV)," according to Boeing. Work has been ongoing to get KSC ready as a landing site for the X-37B, but Vandenberg is still being maintained as a landing location, with Edwards Air Force Base in California serving as a backup site. At the end of last month, the Internet was aflutter about a possible landing of OTV-4 at KSC. The KSC Public Weather Channel on July 31 posted an X-37B operations landing forecast and landing commit criteria. But it turns out that the July 31 activities were just part of a practice session. "The U.S. Air Force continues to work to stand up Florida and KSC as a potential landing site for the X-37B, potentially by mid- to late 2016," said Air Force Capt. Annmarie Annicelli at the Pentagon’s Air Force press desk. "The exercise was one of a number of rehearsals that the program is conducting in coordination with the 45th Space Wing and Kennedy Space Center to safely land the X-37B," Annicelli told Space.com. In an online fact sheet, the Air Force says the effort is an experimental test program "to demonstrate technologies for a reliable, reusable, unmanned space test platform for the U.S. Air Force. The primary objectives of the X-37B are twofold: reusable spacecraft technologies for America’s future in space and operating experiments which can be returned to, and examined, on Earth." A newly issued Air Force Tech Report video about the X-37B characterizes the space plane as an "unmanned solar-powered spacecraft," but its on-orbit jobs are tagged as "top secret." Does the X-37B conduct reconnaissance missions, the video's narrator asks, or tamper with enemy satellites? Is it a space bomber? Or do all of the above apply? "We don’t know exactly what it does, but it’s safe to surmise that the X-37B will have a vital role in the future of Air Force warfare," the narrator concludes.